In 1794, with Britain at war with Revolutionary France, the Prime Minister, William Pitt, put before Parliament a plan to improve the defences of the country in the event of an invasion. One of the measures taken was to raise “a species of Cavalry consisting of Gentlemen and Yeomanry, who could not be called upon to act out of their respective counties, except on the pressure of emergency, or in cases of urgent necessity.” In the following year, the first troop of cavalry in Gloucestershire was raised, the “1st or Cheltenham Troop of Gloucestershire Gentlemen and Yeomanry”. This was the beginning of what would later become the Royal Gloucestershire Hussars. “… Mr. Powell Snell of Guiting Grange, Northleach, a gentleman of means and good position in the neighbourhood, wrote to the Lord-Lieutenant offering to raise a troop of cavalry in the town and district of Cheltenham. “Official application was accordingly made to Government, and the proposal having been accepted by the Secretary of State, Mr. Snell was able to muster, before the close of the year, a well-mounted and efficient troop of some sixty strong. W.H. Wyndham Quin, “The Yeomanry Cavalry of Gloucestershire and Monmouth”, Cheltenham, 1898. 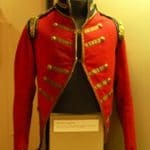 Picture: Jacket of the Cotswold Troop, 1797. In the Soldiers of Gloucestershire Museum collection.